President Barack Obama crossed the Arctic Circle on Wednesday in a first by a sitting U.S. president, telling residents in a far-flung Alaska village that their plight should be the world’s wake-up call on global warming. Obama’s visit to Kotzebue, a town of some 3,000 people in the Alaska Arctic, was designed to snap the country to attention by illustrating the ways warmer temperatures have already threatened entire communities and ways of life in Alaska. He said, despite progress in reducing greenhouse gases, the planet is already warming and the U.S. isn’t doing enough to stop it. “I’ve been trying to make the rest of the country more aware of a changing climate, but you’re already living it,” Obama told a crowd of more than 1,000 in this rough-and-tumble town on Alaska’s western coast. As he closed out a three-day tour of the state focused almost entirely on climate change, the president sought to show solidarity with Alaska Natives and rural Alaskans whose immense challenges are rarely in the national spotlight. His brief visit had the feeling of a campaign rally, with throngs of people cheering and applauding when he invoked the historic nature of the first presidential visit to the Arctic. From the moment Air Force One touched down in Kotzebue, examples of dire poverty and climate-related obstacles were easy to spot. Obama’s motorcade snaked through the town passing rows of rusting shipping containers and dilapidated huts – almost all on stilts to accommodate gusts of wind and other weather-related events. It was a topic Obama brought up, by way of praising Alaskans for their perseverance despite poverty, isolation and a lack of support. He said while many speak of America’s pioneering, independent spirit, in Alaska it’s not just a slogan but a way of life. 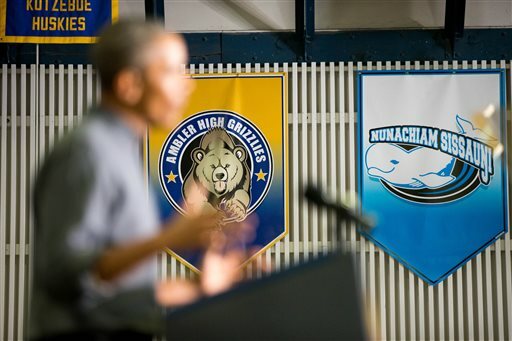 Obama came to Alaska with no grand policy pronouncements or promises of massive federal aid. Instead, he sought to use the changes to Alaska’s breathtaking landscape to put pressure on leaders in the U.S. and abroad to cut greenhouse gas emissions, as he works to secure a global climate treaty that he hopes will form a cornerstone of his environmental legacy. Temperatures in the Arctic are rising twice as fast as anywhere else on earth, Obama said. Permafrost, the layer of frozen ice under the surface, is thawing and causing homes, pipes and roads to sink as the soil quickly erodes. Some 100,000 Alaskans live in areas vulnerable to melting permafrost, government estimates show. As he flew to Kotzebue from the fishing village of Dillingham, Obama directed Air Force One to descend so he could get a closer look at the 400-person village of Kivalina, where residents have voted to relocate the entire village as it sinks into the water. Obama ticked through his favorite sights from his tour of Alaska — the receding glacier in Seward, the spawning salmon in Dillingham and the cockpit of a tiny float plane. He took particular pleasure in reminding Alaskans that, on the eve of his visit, he’d renamed the famed Mount McKinley, the continent’s highest peak, to Denali, its traditional name. Alaska Natives have joined the president in sounding the alarm on climate change. Yet the obstacles they confront daily in rural Alaska extend far deeper, raising questions about whether the federal government has done enough to help. Alaska officials say well over $2 billion in federal and state funds have been spent over the last 50 years to bring indoor plumbing to rural Alaska, but the challenge is finding money to build water and sewer systems in nearly three dozen village that still lack them. As Obama’s travels brought him near the Bering Sea, U.S. officials reported the presence of five Chinese PLA Navy ships in the sea — the first time they have been observed there. White House press secretary Josh Earnest said U.S. officials didn’t view the Chinese vessels as a threat but added that the reason for their presence was unclear.